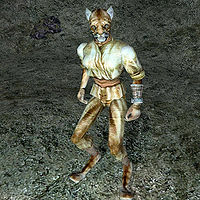 Inorra is a Khajiit slave working in the Caldera Mine. She is wearing a common shirt, pants, belt and the standard slave bracer. She is also carrying a miner's pick. Like all Khajiit, she can see well in the dark and can demoralize others for short periods, but otherwise knows no spells. Because of a recent incident where she and the other slaves attempted to revolt, she has been assigned to the dangerous deep scouting position in the mine by security chief Elynea Norvayn as punishment for her "insubordination." If you have the Caldera Slave Key, you can free her and the other slaves at the mine. This will help you earn the respect of the Twin Lamps. This page was last modified on 30 May 2013, at 16:35.